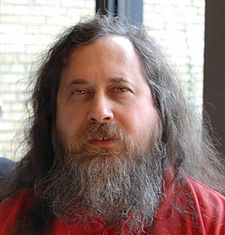 Saw Stallman tonight. Whatever else, one must appreciate the man’s dedication. He certainly takes a more hard-line approach to his free software diet than most of us would find convenient, but you must understand that convenience is absolutely not at the top of his priority list. To him, it’s not just software. Software is his life, and in his life, freedom—freedom to share, freedom to know what you’re putting on your computer (on which may also reside a good chunk of your life), freedom to fix that which is broken, and so on—is non-negotiable. Hypocrite that I am, I’m writing this on a Mac running OS X and in TextMate, a most proprietary text editor, but I’m not oblivious to his concerns. At times his rants feel shallow. But he speaks convincingly about the evils of software patents and those pesky little unadvertised features that find their way into products in which we place our blind trust. No, not those wonderful hidden Easter eggs, but those hidden gems of unadvertised privacy infringement. You know, those “features” that allow our software’s developers to observe our behavior so that their products may better serve us. Almost beneficial, it seems, until one begins to wonder why we’re not given the option to voluntarily opt into such innocuous, even magnanimous, features, when we’re even told they’re there. Well folks, some things that are best for consumers are not best for distributors. For instance, it’s much better, so far as my budget balances, to watch the many free but not-so-legal movies available online than it is to pay for legal versions. What’s more, those free, online movies are often better than their pay counterparts, in that I can do what I damn well please with them. I can copy them, move them about, give them away, whatever. Great for me. Not great for Sony. But it’s not just just about protecting profit lines. In rare but inevitable circumstances, hidden features can be actively used against us in utterly nefarious ways. Like say the guvment gets it in their heads that some of its concerned citizens are really just enemies in disguise and takes it upon itself to protect themselves/us/who-the-hell-knows-who through conveniently placed back doors in consumer operating systems. Government of/by/for the people and all that notwithstanding, sometimes what’s in the best interest of the government is not in the best interest of the people it represents. Such bitter pills can be hard to swallow, so we’ll just keep the whole works under wraps and what the people don’t know… It’s just spyware. Microsoft Windows, and probably Mac OS X too, they’re spyware. If your software broadcasts information about its users in a clandestine way, it is spyware. Right? Which brings me back to free software. What’s really nice about it is that it’s really nice. It hides nothing, it’s all there. No secrets, no lies. It’s usually free as in beer, though it only claims to be free as in speech, and you can have your way with it. In fact, it’s superhumanly nice. It shows up at your door buck naked, exposing all, hiding nothing. You can probe its darkest corners, and when you’re done, feel free to share with your friends. And there’s the rub. Free software just doesn’t jive with human nature. It’s superhuman, really, just too innocent to make it in this dog-eat-dog world, and likely to find itself fully exploited and grossly unappreciated. This entry was posted in Programming and tagged stallman freesoftware drm softwarepatents rant, textmate programming. Bookmark the permalink.